Join us for a creative and adventurous stay in Morocco where we’ll be journeying together for 8 nights, 9 days. We’re starting off in Marrakech and then we’ll head east over the Atlas Mountains, reaching the summit of Tizi n'Tichka, the highest major mountain pass in North Africa. We’ll be experiencing the artisan wonder of the Rose Valley and hospitality in the palm oasis of Skoura. We’ll go further into the Dades Valley immersing ourselves in local craftsmanship and entrepreneurialism. Afterwards, we’ll be making our way back staying in Ouarzazate passing by the photogenic and historical Aït-Ben-Haddou and then into the Agafay desert where we’ll have a unique experience staying in eco-luxurious tents. The entire journey will be immersive, cultural and pushing you beyond your comfort zone, which is very much the natural tendency when visiting Morocco. You’ll witness the beautiful diversity the country has to offer from the bustling Medina of Marrakech, a culturally renowned UNESCO World Heritage Site, to the rural village roads as we tour the outer regions of the desert. We have designed a unique itinerary that will introduce you to the real Morocco exploring both urban and rural environments with a wide array of local perspectives guiding your hands-on experience. All meals and transit are included in the itinerary, to keep things stress free. Below are some highlights of the itinerary we offer. If you have any questions, just contact us and we’ll prepare you with everything you need to know to make this incredible journey happen. Crafting traditions are a window to the culture and soul of a country. On our journey you’ll be introduced to many local artisans who produce a variety of goods from textiles and pottery to basketry and henna. You’ll be able to get hands-on and have a go yourself, whilst intimately connecting to the cultural experience passed from generations. From traditional Moroccan riads and ancient earth-built kasbahs to tented desert camps, we’ll be staying at a variety of boutique accommodations whilst journeying through the country. Each stay is design-led with its intrinsic beauty that is equipped with comfortable beds, refreshing showers and plenty of space for scenic views and private reflection. Morocco is an enchanting place unlike any other. With a unique fusion of African, Arabic and European influences, the country welcomes you with a glorious array of vibrant colours and dazzling scents. 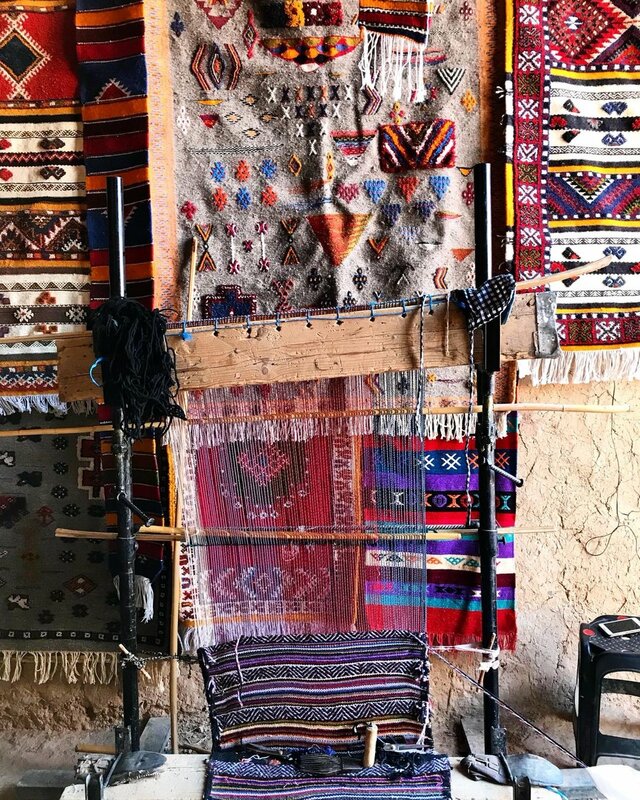 From natural dyeing in the souks to cooking classes in an oasis, you'll be out there exploring and satisfying all curiosity and senses. Get to know the creatives shaking things up, whether its a local designer working with widowed women on the coolest scarves or the female publisher questioning modern Moroccan identity. We’ll connect you with the leading inspirations of global culture and authenticity that are sowing seeds and building relationships for a brighter future. After years of research and travel throughout Morocco, we have put together a colourful black book filled with all our favourite local gems, many of which you won’t find another tourist nearby. We’ll share the joy and excitement these deeply enriching places bring us; expect roadside basket stands, covetable vintage spots tucked away in the mountains and weaving co-ops packed to the brim with inspiration. In the Agafay Desert, peacefully isolated from the connected world, we’ll sleep under a blanket drenched by the Milky Way stars. A sensational three-course dinner is followed by music around the fire. To cap the evening off, a local astrophysicist will enhance our knowledge of the universe. All eco-luxury tents come with a private bathroom, shower, wood-burning fireplace and free toiletries. Hop on board the Magic Bus! DETAILED ITINERARY: We will provide a daily itinerary detailing all activities, accommodations and schedule of the journey once you have completed full purchase of the trip. ARRIVING: Book your airfare to Marrakech Airport (airport code: “RAK”) arriving on Friday, 22 February, 2019. Once you land in Marrakech, we’ll have a driver pick you up and take you to our riad. LEAVING: Book your airfare from Marrakech Airport (RAK) departing on Saturday, 2 March, 2019, and we’ll take you to the airport. EXTENSIONS: If you wish to arrive earlier or stay later, we can assist developing and facilitating your itinerary for an additional fee. Incidental expenses, such as but not limited to, flight cancellation, lost luggage, property damage, personal injury, etc.. ACCOMMODATIONS: During our trip we will be staying in design-led accommodations that focus on sustainability. All of our stays include rooms with two beds or a bed for two people. During booking please let us know if you are booking with someone else and wish to be staying with that person. Individual bookers will be assigned a fellow traveller of the same gender to share a room with, whom we’ll introduce you to before departing. There will be an additional charge for a private room, so please email us before booking. SPECIAL NEEDS: Please let us know prior to booking if you have any special need such as dietary requirements, allergies, limited mobility, visual and/or hearing impairments, etc… We will do our best to accommodate any and all special needs notified prior to booking, but it is possible in order to suffice special needs, additional costs will be excised. PRICING: The total price for this trip is £1,550. We are offering an early bird price of £1,350 that expires on 7 January 2019. A 40% initial non-refundable deposit (£620) per person is required to reserve a spot and is included in the total price. Final payment is due no later than 30 days prior to the trip starting date. Any booking made after 8 February 2019, the entire trip cost of £1,550 is due upon booking. BOOKING TERMS AND CONDITIONS: Please read our Booking Terms and Conditions for the details of our service transaction, which you agree to when booking a trip.